Stories are comprised of different elements. Characters, plot and setting being the main three. Yet every writer writes differently. Some start with plot. Others start with characters and then create a plot that will generate the most conflict possible. However, there are times when a writer is so inspired by a setting that they just have to write a story about it. That’s what happened to me. The first time my mother-in-law introduced me to Ouray, Colorado, I knew I had to use it as a setting for a story. The town was so beautiful and unique that I wanted to tell everyone about it. Six books later, I’m still singing the praises of my most favorite place. How do you make setting an integral part of your story? A writer’s first instinct might be to throw in loads of description. But if you’ve spent any time here in Seekerville, you know that won’t fly. We cannot wax poetically for paragraphs on end because editors do not like that and, frankly, it can get boring. And rule number one is don’t bore the reader. So whether your setting is a real place or simply lives in your mind, here are a few ways to make the most of it without beating readers over the head. Is there something about your setting that makes it different from other places? 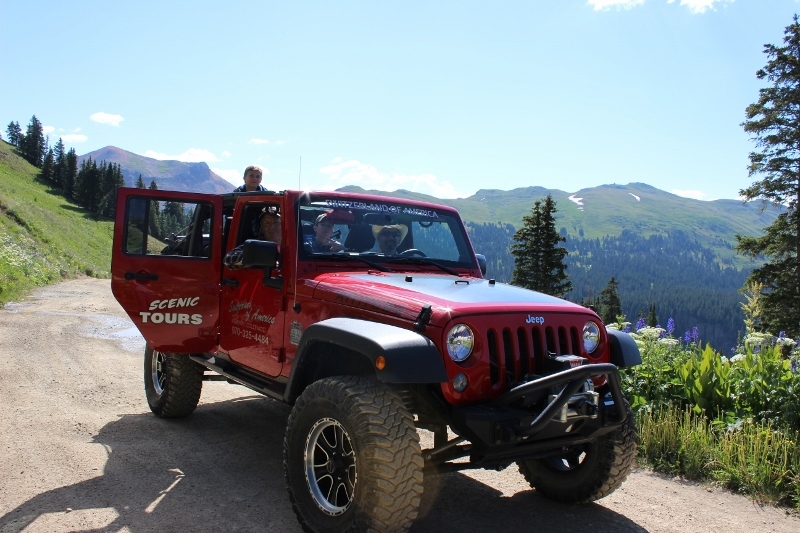 Ouray is the Jeeping Capital of the World. 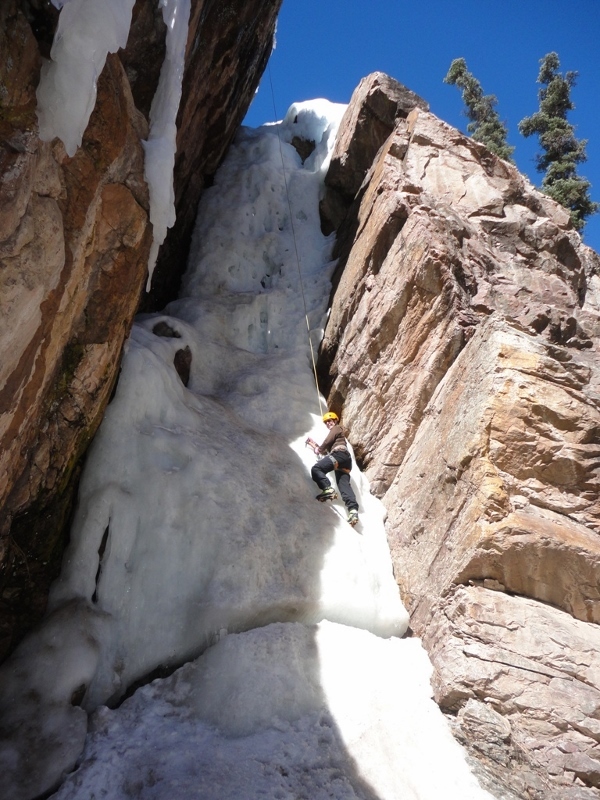 It’s also America’s ice climbing capital. So, naturally, I’ve incorporated a hero and a heroine who’ve owned Jeep tour companies into my stories. I’ve also had an avid ice climber and mountain guide. And then there’s Ouray’s rich mining history, which still goes on today, allowing me to have a hero who was a miner. 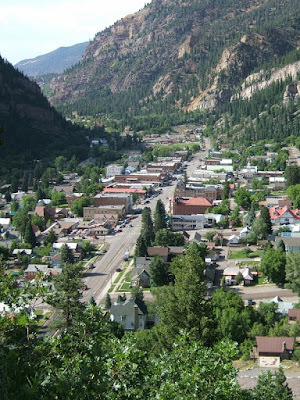 During the gold rush, Ouray, population 1000, was a thriving mining town that boasted more than 10,000 residents whose legacies still live on in the abundance of historic homes and other buildings, making it ripe for bed-and-breakfast owners and restoration projects. Think about your story. Are there any jobs or hobbies unique to its setting? Ouray is a tiny town with one grocer, a hardware store and no drive-thru restaurants. It’s a minimum of thirty minutes to the nearest fast-food restaurant, supercenter, home improvement store and hospital. That means that when my self-reliant heroine has a flat tire on her motorcycle and needs a plug to fix it, but the hardware store is all out, she’s stuck. Yet while these limitations may force the writer to be more creative, the good news is that they can also create conflict for our characters. Like when the clerk at the hardware store suggests our heroine check with the Jeep tour company across the street, where she would be forced to ask our hero, the one man she does not want help from, to help her out. Ask yourself, does my setting present any limitations? Talk about a V8 moment. Here I was trying to contrive something that would put my character in danger, when I could have that danger grow organically out of my setting. Which, in the end, made a much stronger story. 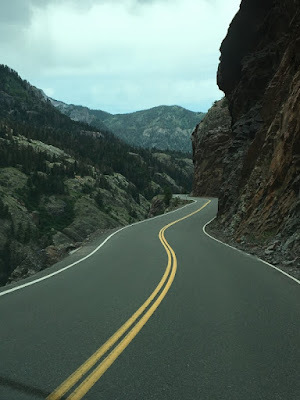 The main highway that leads in and out of Ouray can be very scary to drive even in the best of conditions, with its harrowing curves and sheer drop-offs. But that drive can be downright treacherous during a winter storm. And what if they close the road, which often happens. Then our character is either trapped in Ouray or forced to find an alternative route that could take them someplace unexpected or make them miss the flight they really have to be on. Going back to your manuscript, how can your setting wreak havoc with your characters? Whether your setting is real or fictitious, you owe it to yourself and your readers to learn everything you can about it. What makes it special? If it’s a real place, how do locals view things versus how visitors see them? Learn what they might do or where they might go. 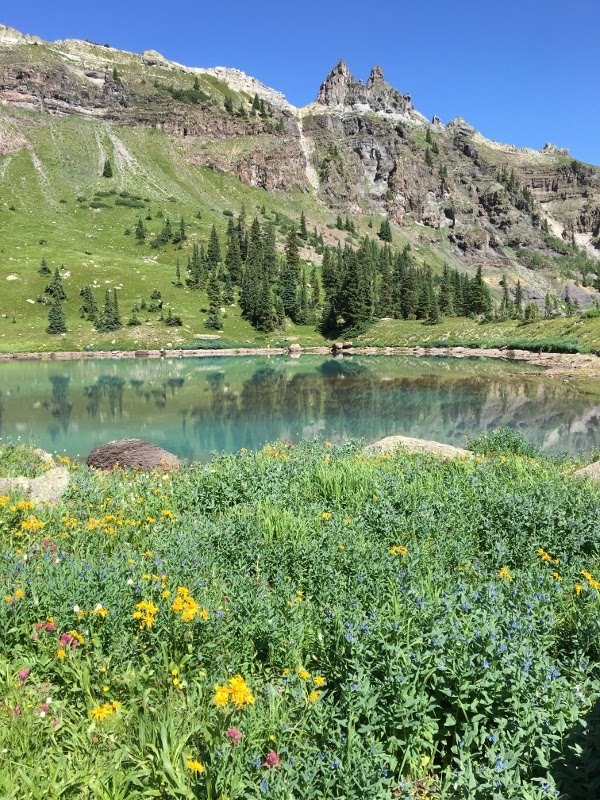 In Ouray, while all the tourists are flocking to Yankee Boy Basin, the locals might head to some little known place like Silver Basin. Had it not been for my friend Brandy who owns a Jeep tour company in Ouray, I might have never discovered Silver Basin. Have you taken the time to get to know your setting? Setting is an important part of any story and can be a powerful tool. With a little thought and planning, or research and exploration, you can make the most of your setting, putting it to work for you in ways you might never have imagined. And in the end, your story will be better for it. Now it's your turn. What’s your first step in creating a story? Plot, characters or setting? Do you take the time to think about your setting? I love settings, too. I love creating towns with weird characters, mean characters, loving characters... but the place they live, the physical geography and the visual we give the reader are such a huge part of the story... it places the events and the people. And now I want to go to Ouray! Is the chocolate shop still there????? Oh, you bet Mouse's is still there, Ruthy. It is SO good. Great. Now I want chocolate. When shall we go? Mindy, these are excellent tips. I need to use setting better in my writing, and I struggle with it a bit. It feels forced sometimes because using my setting doesn't come naturally to my brain. When I read other authors, I take note of and admire their use of setting, how it layers their writing. Your tips are going to be of great help. Thank you! - Hey, I've been awake since 2:00 AM. Who's bringing the coffee? I need a strong cup today - a little coffee and a whole lotta Jesus (thanks, Tina)! Karen, I can't believe Ruthy didn't bring the coffee. Here you go, hon. Here's fresh pot. And I've got tea steeping, too. I'm the first to admit that I can write an entire scene of dialog and then suddenly think, "Wait, where are they and what are they doing?" So then I have to go back and sprinkle in those other things. But in the beginning, when I'm plotting, that's when I think about the big picture and how I can use my setting in the story. Reading, and looking to see how other authors use setting is a great way to learn. Highlight sections and then dissect them to see how they put things together. Karen... I just refilled your coffee mug!!!!!!!! Mindy, we lived in Colorado for four years, briefly in Colorado Springs and then in Fountain, a tiny town outside the Springs. It is an amazing state. We loved going up to Cripple Creek and Vistor. There is nothing like it. The Quaking Asppens in the fall are unforgettable. I tend to have a convergence of setting AND character, the germ of the character comes to me at the same time I get fixated on a setting. Of course I have to refine them, get their deepest fears, the lies they believe etc., but it's pretty organic with me. An impoverished young widow thrust on to the Oregon Trail along with the man who betrayed her, a sheltered debutante coming up against New York's Hell's Kitchen, a young contemporary woman fleeing from the unconditional love in her tiny home town because she doesn't feel worthy. Miss you guys, off to temp job, last day for a while. Wow! That's powerful, Kathy. Lots of good hooks in that teaser. So it sounds like your characters grow out of a setting. Or vice versa. But either way, they're connected. That's great. It's because we have nice weather here and all I can envision is Ruthy, in the sun, cleaning the winter-weary yard!!! That's all right, Ruthy. When winter lingers until May, anyone would be eager to get outside. I LOVE Ouray! Thank you for sharing these gorgeous photos. My pleasure, Caryl. I love it, too. This is very helpful! I actually LOVE descriptive bits in stories, but I know they aren't wanted as much any more, so this was so informative how to include bits of an area. Thanks! Good morning, A.M. Pine. Thanks for stopping by. Am I the only one who yearns for the occasional wax poetic description, where you feel the scene behind the scene? I must admit that some of what's called purple prose now, is very pretty wording. You're not the only one, Ruthy. It's just tough for writers to get away with it these day. Or maybe it's just tough for them to do it well enough for the editors to leave it in. Mindy, great insights! And I LOVE your photos. (Oooh...that highway though! Yikes!) 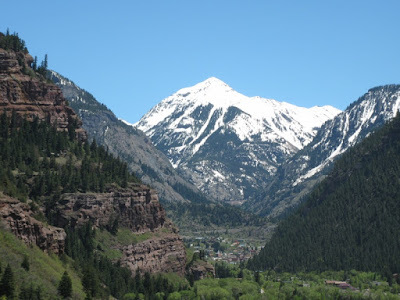 Now, I must put Ouray on my "must see" list. I enjoy small town settings. You are so right. Making our setting work for us makes for a smoother, unencumbered read. Years ago, one of my favorite romance authors (who has since retired) enthralled her fans with page after glorious page of relentless, colorful descriptions. It wouldn't fly today, but tight, clean writing can be just as enthralling if we use setting strategically without overkill. Cynthia, Ouray truly is a must-see. And you know, setting description can go either way. I remember reading a book where a guy walked into a bar (no, that isn't the start of a bad joke) and the author spent an entire page describing the bar when the neon beer sign and smoky air would have been sufficient. But done well, setting can become a secondary character. He is a keeper, Janet. Even though it drives me crazy when he starts talking like a writer. Ouray is, indeed, quaint. I hope you've taken the time to do some exploring the mountains while you were there. Now that I'm living in Colorado, I'm itching to go visit Ouray. Sounds/looks like a great visit for a family "stay-cation". I do like your ideas for how to make my setting work for my story. Yes, DebH, you should definitely make the trek over there. Hope the ideas help. When I start a story half the time it's inspired by a plot and half the time by characters. The setting normally comes along later. But it comes along and I normally spend a ridiculously long amount of time on it coming up with tiny little facts about it. Like for instance in a short story that I wrote, it takes place in the world of the fae. I decided that I wanted it to be a forest separated from the human realm. But I went a step further, this forest, the coille na h-oidhche as called by the inhabitants, but is known as the Forest of Night by the humans. It is a world where the sun never rises. Instead of day and night, the fae rely on the rising and the setting of the moon. Day is Highmoon, night is Nethermoon. Iriale in League of Thieves is a desert city and is basically based off of the idea of what would have happened if Rome had conquered Persia instead of Greece. Nicki, you're creating your own world, aren't you? Although, I guess even if it's a contemporary romance set in a fictitious town, the author does the same thing. But in a fantasy, the sky is the limit. You, the author, create the limitations. My hat's off to you for that. Oh my gosh, Mindy! Is that really you climbing that steep wall of ice? My knees are shaking!!! Love this post on setting! I've been living in the Amish world. I'm in the house, I'm cooking on the wood burning stove, I'm lighting my oil lamp or washing my hands outside at the pump. It's almost eerie the way I can settle into Amish-land. Hopefully, my readers experience it the way I do. Sent the second book in the Amish Witness Protection continuity to my editor on Monday. Then I had to step out of that plain world and come back to my real life. I'm still struggling with book-ending-regret. Anyone else have a letdown when the book is done and you type The End? Congratulations on sending off your book, Debby. Not sure I can relate to the book-ending-regret, though. I'm usually glad when it's gone. Because then I get to move on to the next one. I will say, though, that coming back our real lives can be a letdown. I mean, the house needs cleaning and the family expects to eat. Oh, and yes, that's really me. And I was wearing all kinds of safety harnesses. Still, when that ax comes loose, the heart immediately goes to the throat. Until you realize that you're not going to fall. I love your books set in Ouray! Unfortunately, I haven't been able to read all of them but the ones I've read, I feel like I'm right there! I've wanted to go there too! I love Colorado and that's the state my hubby and I want to retire to - eventually! It's gorgeous! I think the setting is SUPER important! It has effected so many stories I've read. Thanks for your post! Valri, you have made my day. I'm so glad you like the books. My grandchildren live in Texas (Abilene) and my brother lives in Dallas so we have some Texas ties also! Great post, Mindy. I will definitely have to visit Ouray sometime. The book I have just finished writing is set right here where I live in south central Nebraska. Setting is important because it is about a tornado that destroys a small town and the beloved church. One of my main characters is the local weatherman who is credited with saving many lives because of his great coverage of the storm. Sandy, you know what they say. Write what you know. I bet you know your setting better than anyone. And the story sounds awesome. Of course, I am a bit of a weather junkie. I have one question, though. Do you ever go out to your setting and look at it with a different eye? Because sometimes we grow immune to the same old same. Do you try to look at it with a fresh eye? When I started the first book in my Love Inspired series that's set in fictional Canyon Springs, Arizona, I just KNEW that was where I wanted to set it. That part of Arizona--mountains, pine trees, snow--isn't that familiar to a lot of readers. So it was fun introducing it to those who think of Arizona as solely sun, sand and saguaros! My Hearts of Hunter Ridge series, likewise, was set in that area, too. I've never been to Ouray--Your photos have convinced me I think I need to go! Re: the pic. YIKES! How on earth did you get the guts to climb up there??? Glynna, I had a guide and determination. And what I climbed was minor compares to what the pros do. Those people attempt things that have them going upside down. Yes, I guess I have the typical thoughts on Arizona. Think Phoenix. However, I've read your books and I loved the setting. I'm not sure I even realized it was Arizona. But then, once I get a picture in my mind, that's kind of where things stop. I'm a visual person. So I'm thinking that all of us who want to go to Ouray, and I'm including myself since I always want to go to Ouray, should schedule something at the same time. Oh, would we have a grand time. Very enjoyable post! When I come up with a new story, it's often a bit of plot that gets the ball rolling, then setting, then characters. I often use real historical events as a springboard for my stories, so the setting is often pre-determined. I love using setting as a character, and I love reading stories where setting plays a major role. Erica, I often wish I wrote historicals. There are so many stories in Ouray. Some great characters from the past. One in particular really intrigues me. How I would love to bring her to life. Unfortunately, I write contemporary and God has not laid anything historical on my heart. Sigh. Mindy, I'm late! But I'm glad I came back by. Great post! I especially appreciated when you said to use setting to create limitations. I love that, because I'm always looking for more conflict. Thanks for the reminder! Missy, I know what you mean. Conflict just doesn't come easy, does it? No, it doesn't. It's my biggest hurdle in every story. Missy, I recently finished a ms and was reading through it and found one chapter that just wasn't working. It was BLAH. Then I finally realized it was because there was no conflict. I had to write a new scene. Hi Mindy, what a fun post. You've stirred my creative juices. Thanks! Usually setting is the least important aspect to me, as a reader and consequently as a writer. I usually start with character or theme. Sometimes an overarching plot. I've been trying to incorporate more setting into my books, and this post is a great place to start. Thanks. Lila, I tend to forget it in my first drafts. My cp usually has to ask me to describe the setting to set the stage for just about every scene! Lila, theme is always important when starting any book, and that's often where I struggle. Until I come up with that, I kind of flounder. Mindy, what a great post! I love setting. :) I actually begin my stories with an idea and then I dive into the characters. So far, most of my stories have taken place near where I live. I so appreciate your examples of all the different things we can to so the setting almost becomes a character in the story. As I'm drafting my current WIP, I'm not describing things as much. But, as I read, I began thinking about ways I can bring the setting more into the story. Thank you for the inspiration! Good morning, Jeanne. Since your stories tend to take place near you, be sure to drive those areas and look at them with a different eye. See if there aren't little nuances that you might normally overlook. Or think about what makes it special and why it's important to the story. It'll all come together. One of the great things about setting is that it can act as a sounding board for what is going on in a character's mind. How a character sees the setting can tell a lot about what is going on inside that character. Going into the courthouse a character sees the beautiful flowers and the mountains in the background as a reflection of God's madjesty. Coming out after losing his case the same character sees the mountains as barriers to his freedom and the flowers make him feel like he's at a funeral. Setting can also foreshadow story events and mirror future events like a volcano erupting at the climax of the story. Myra's "Autunm Rains" is a wonderful example of this. Of course, as a marketing person, I always want a setting that commands high public interest like Nevada Barr's novels set in National Parks. I call this 'building the marketing into the story before you write the first word.' Make everything about the story sell the novel. Give the marketing people some help. Setting is not just wallpaper…it's a character in its own right. You make some excellent points, Vince. Especially regarding a character's perception of the setting. I used to use the example of someone walking into a blue room. Based on their backgrounds, one person might find it calming, that it reminds them of the beach. While someone who grew up in an abusive household that happened to have blue walls will be ready to flee. As always, we appreciate your insight, Vince. 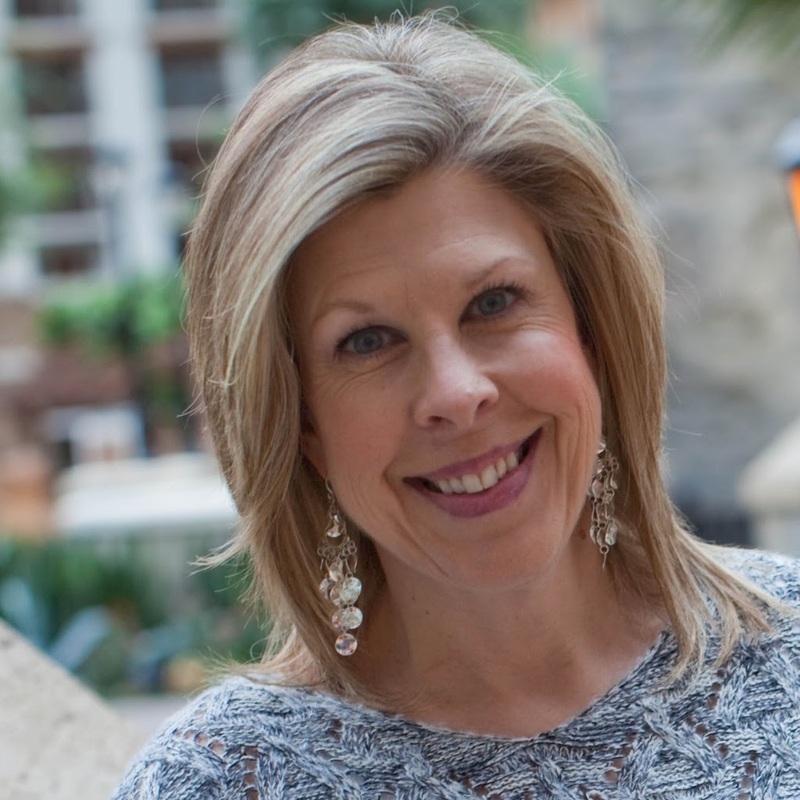 Mindy, of all the places here in this country where a book would take place, I chose Lexington, KY, for my first romance novel (in progress). Just by going to one concert in the state, and making new friends as a result, I have the perfect setting. My character is a bored, stir-crazy woman who is legally separated from her husband. She moves to Lexington from Oliver Springs, TN, where she works at a used bookstore. I have to say it feels so good to be back on this site. I've been away for a little while, getting adjusted to living in my new house.